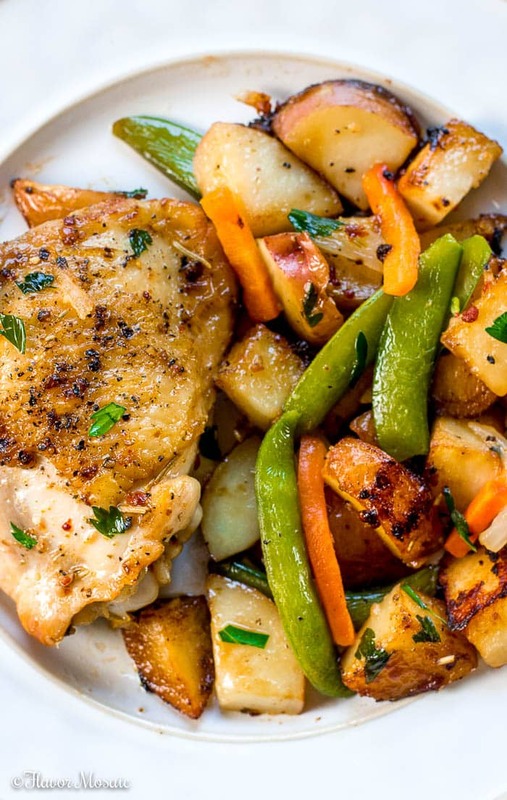 Chicken Vesuvio is an Italian-American garlic chicken and potatoes dinner cooked in a skillet with sugar snap peas and carrots in a white wine sauce for a hearty, rustic chicken dinner. When I first heard of Chicken Vesuvio, I thought it was an Italian dish originating from Italy. But really it was created by Italian-Americans and is a regional dish of Chicago! It is to Chicago what Tex-Mex is to Texas. It is believed that Chicken Vesuvio was probably created at a 1930’s Chicago restaurant named Vesuvio’s. It is an old-school classic chicken and potatoes dish that roasts bone-in chicken with potatoes in a white wine garlic sauce. It is usually started on the stove and finished in the oven. Dave and I visited Chicago several years ago and saw the musical, Jersey Boys, for the first time there. We loved visiting there in the summer and loved all the restaurants, and the lake and the energy of downtown Chicago. Whenever I cook Chicken Vesuvio, it brings back memories of our visit to Chicago. I wanted to make Chicken Vesuvio but didn’t want to have a long cooking time. So I made a few changes to speed up the cooking process. I used smaller chicken thighs only. 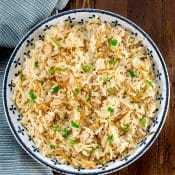 I didn’t want to use boneless chicken breasts because I wanted to try to stay true to the original roasted flavor with the bone-in skin-on chicken. However, instead of using larger bone-in chicken pieces, I use only chicken thighs, which can cook in a covered skillet over high heat, so I can skip the oven. 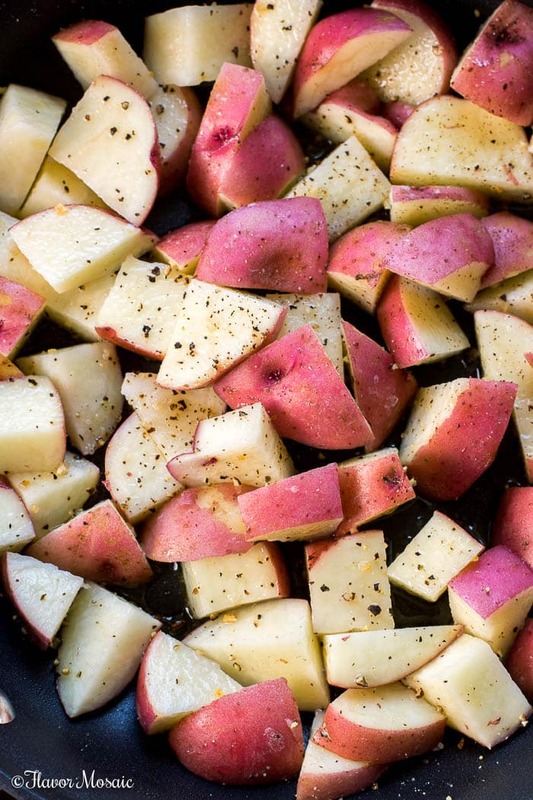 Secondly, I cut the potatoes into smaller, bite-sized pieces so they cook faster. 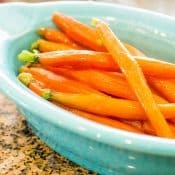 This way they will cook up in the skillet and there is no need to transfer them to the oven. Lastly, while I love one-pot meals, I don’t love them if they cause dinner to be late. 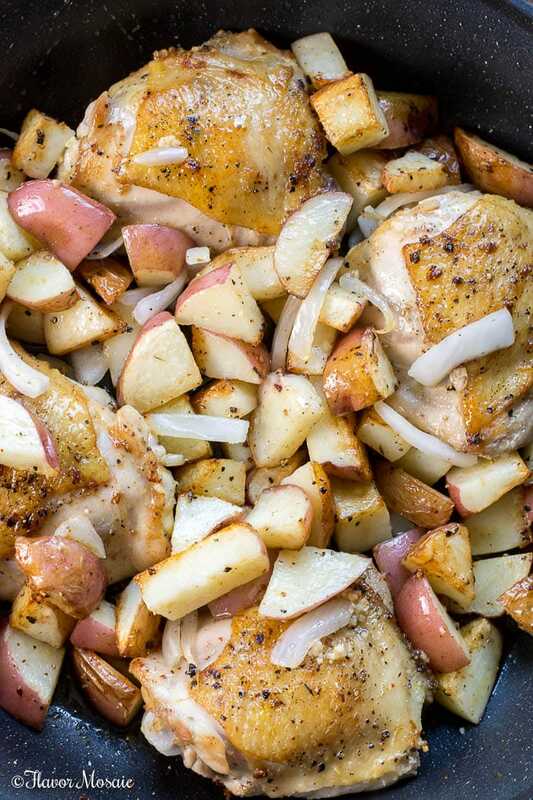 For this Chicken Vesuvio recipe, I used two skillets, one for chicken and one for potatoes. That way both can cook at the same time. Then after the potatoes are cooked, I add them into the skillet with the chicken to finish cooking. 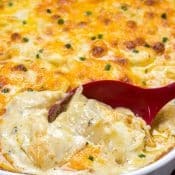 What Makes this Chicken Vesuvio Recipe Unique? In addition to making a few changes to reduce the cook time, I also tweaked the traditional recipe to add a few more vegetables. I still tried to keep the overall flavor of the dish but wanted to turn it into a more balanced meal by adding a few more vegetables. So I added sliced onions, carrots and sugar snap peas. Traditionally, in the Chicago version, they add frozen peas at the end of the cooking process. However, if I’m cooking in a skillet, I preferred to use sugar snap peas instead of frozen green peans because I prefer the texture. It is really a matter of preference. If you want to use frozen peas, go ahead ad do that. For convenience, I used a bag of frozen snap peas that had carrots in it. It just made it quick and easy. To kick up the heat a little, I like to add a few red pepper flakes. However, this is completely optional. If you like a little spicy heat, go for it. If you don’t like spicy hot, then just leave it out. That is the wonderful thing about cooking in your own kitchen. 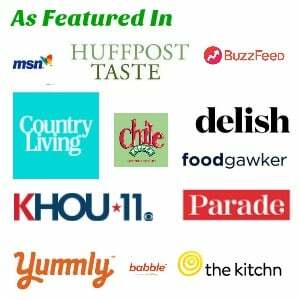 You can tweak recipes to be just the way you like them! The Sauce! Oh my, the sauce! After the chicken is browned and while it is still cooking in the skillet, add the white wine and watch the steam rise! 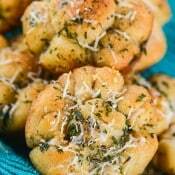 It also adds so much flavor to the chicken, along with the garlic and Italian herbs. 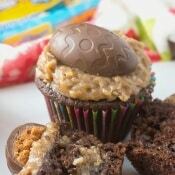 My mouth is watering just thinking about this. While I add a few modern twists to this old-school, classic Chicken Vesuvio, I stayed true to the overall flavor and character of the recipe. 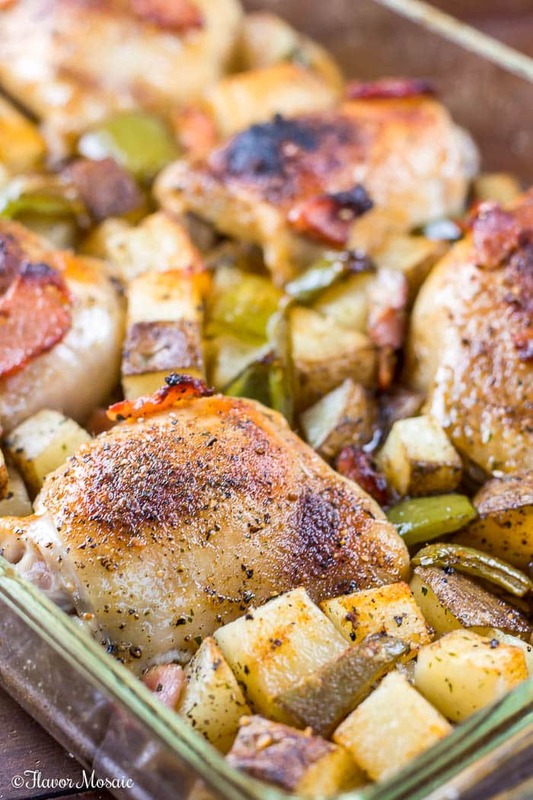 For this Chicken Vesuvio recipe, you will need 2 good quality skillets with lids. If you don’t have a lid for these skillets, you can usually use another skillet or put a sheet pan over the top of the skillet. 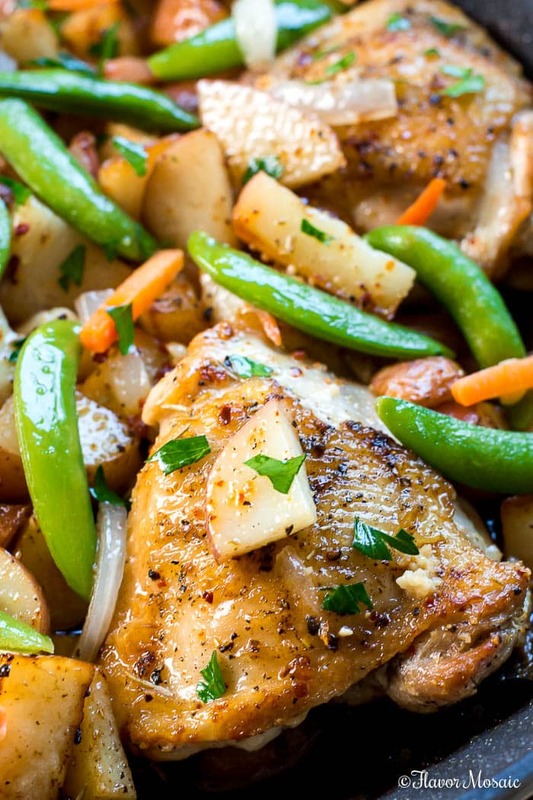 It is now your turn to make this Chicken Vesuvio recipe. 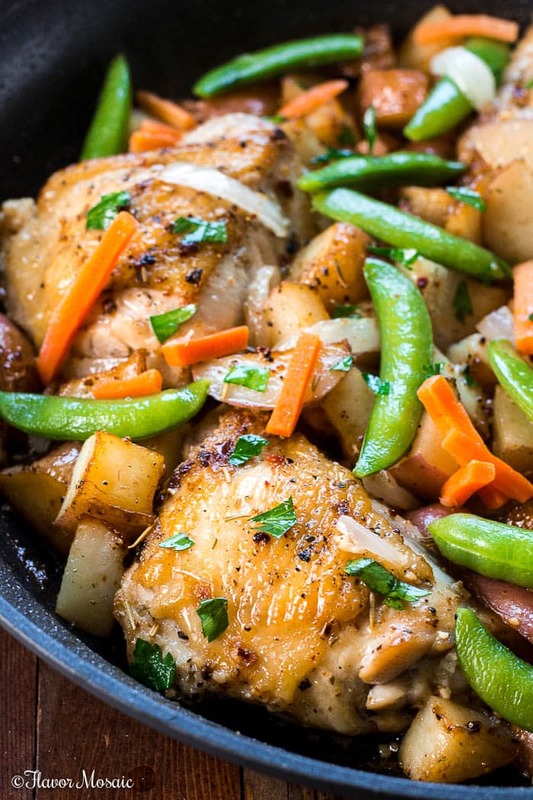 Whether you are from Chicago, wish you were in Chicago, or are Italian, or just like Chicken and potatoes, you are going to love Chicken Vesuvio. It is comfort food at its best. 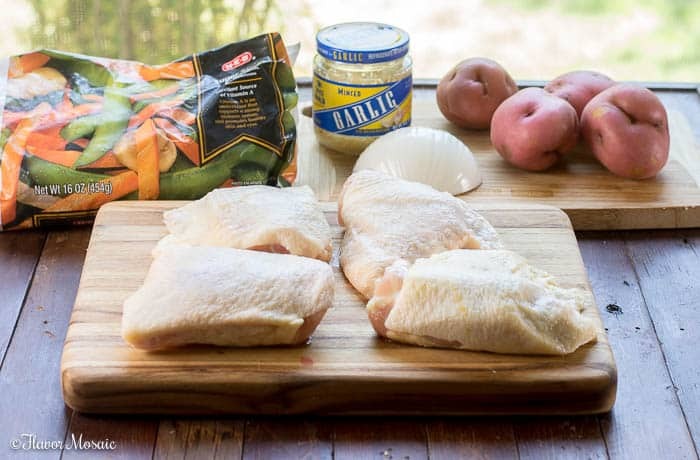 Be sure after you make it, to come back and let me know how you liked this Chicken Vesuvio recipe. Leave a comment and let me know what tweaks you made, etc. 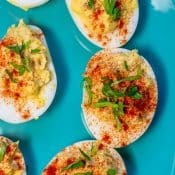 I bet your whole family will love this recipe! 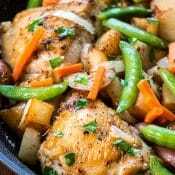 Chicken Vesuvio - an Italian-American chicken dinner in a skillet with potatoes, garlic, snap peas and carrots. It is popular in Chicago. 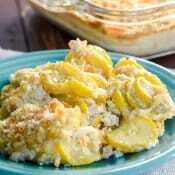 In a large skillet, add 1 tablespoon oil and add the chopped potatoes. Sprinkle with salt and pepper. Cover and cook on medium heat. Turn occasionally. After the potatoes have cooked for about 8 minutes, add sliced onions and cover the pan and cook for another 8 minutes. While the potatoes cook, sprinkle chicken on all sides with salt and pepper. 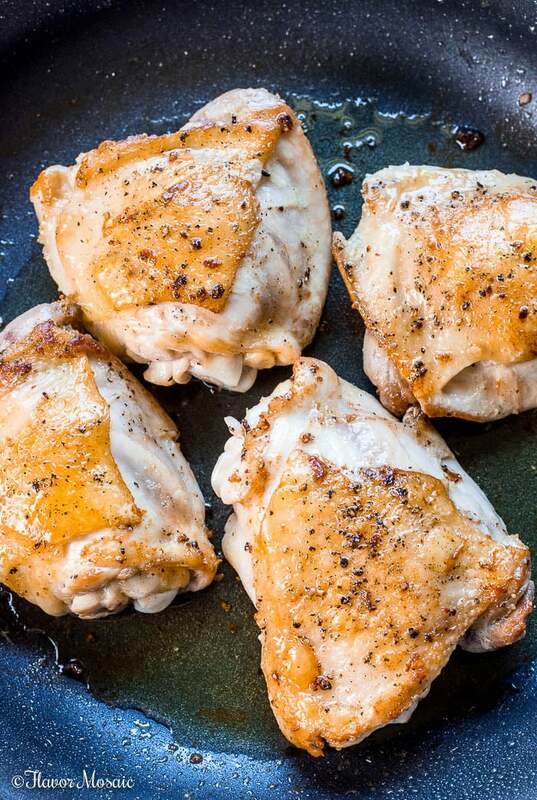 In a separate large skillet over medium-high heat, add oil and chicken thighs skin-side down and cook for 7-8 minutes or until skin is browned. Turn chicken. Sprinkle with salt, pepper, Italian seasoning, and crushed red pepper, if desired. Add the minced garlic and stir. Pour in the white wine and chicken broth. Then add the potatoes and onions. Cover and cook for 15 minutes. Add the sugar snap peas and carrots. Cover and cook for 7 more minutes. Sprinkle the Chicken Vesuvio with chopped parsley and serve hot. Cooking time for the chicken depends on the size and thickness of the chicken pieces. 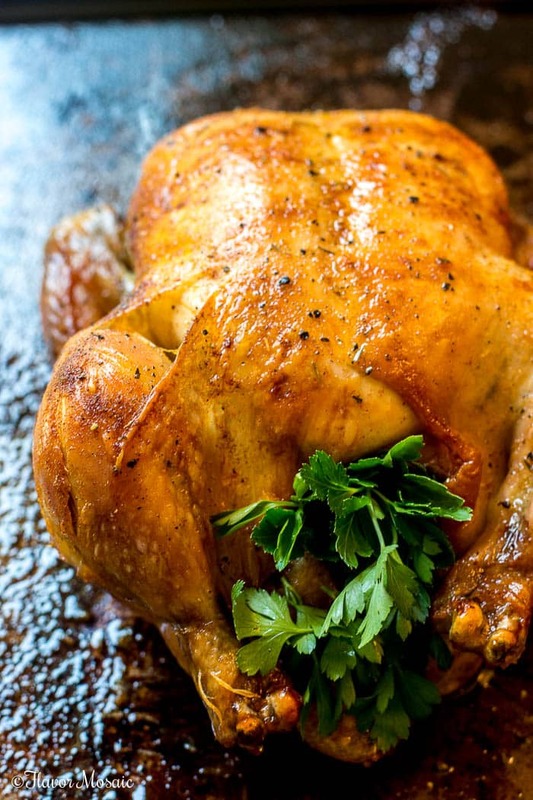 If you have larger, thicker pieces of chicken, they may take more time to cook. 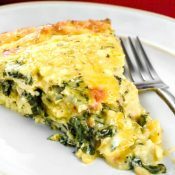 Smaller pieces may take less time to cook. 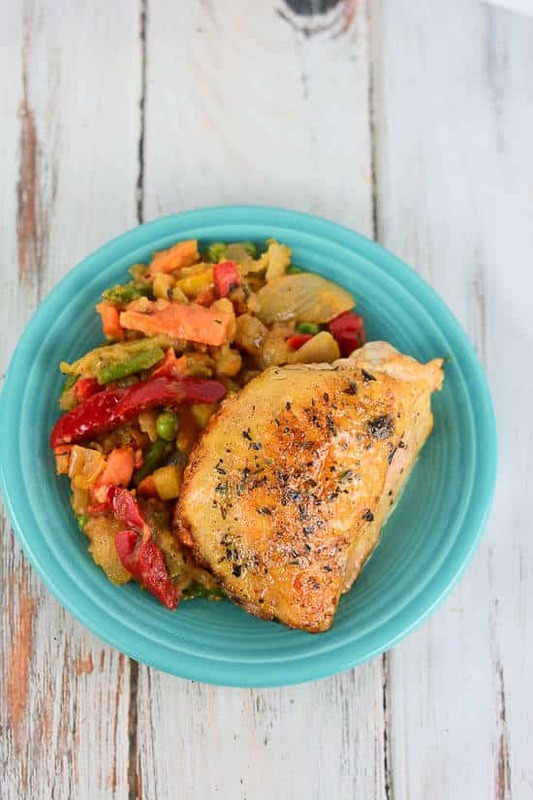 If you like this Chicken Vesuvio recipe, you will love these other chicken recipes!